I would use it as a backdrop for green and cream candles in my bathroom. I'd use it as a curtain in the upstairs closet window. Yes, my closet has a window. Why? Who knows. I'd use it as a dish towel. It's nice to do mundane tasks with things of beauty. It would be the prettiest dishtowel on my block. And it's a big block. I actually need a few new dishtowels but would probably just use this one for decoration. I would put it in my kitchen and make my dishes become slaves to its awesomeness. Or maybe I would just carry it in my bag all the time, never know when you might need a jazzy looking towel. 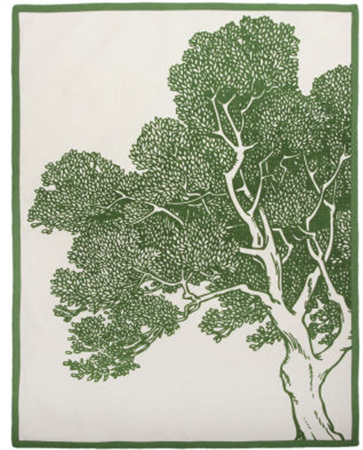 I'd add it to a collection of artsy towels that could be hung on a clothes line in my fictitious laundry room. Like so http://www.fiberfarm.com/2010/07/going-paper-towel-free. hmmm... I'd either slice it into 4 and stretch the pieces over canvas to be hung on a wall, or I'd slice into 8 and affix them to the bottom of clear 4"x4" glass tiles as coasters. Wouldn't that make a sweet coaster set? Aw yeah.